We do not have advertisements here on TFG, and don't plan to in the near future. But sometimes good things come along and it's important to spread the word. 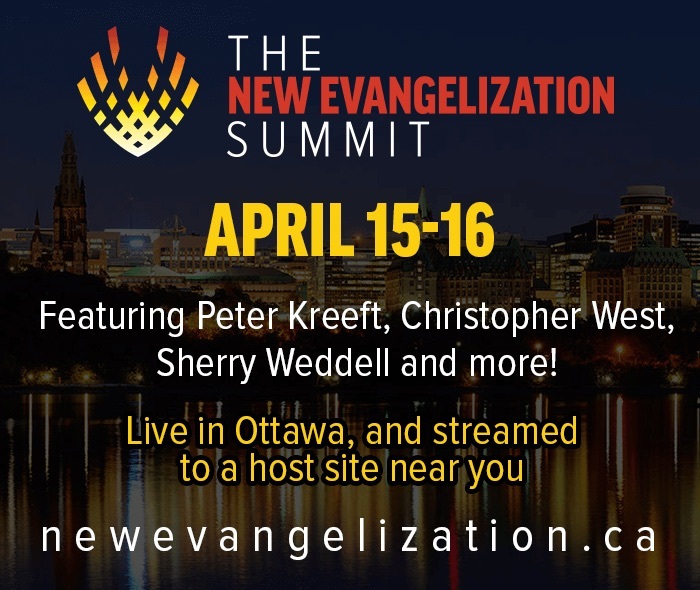 The New Evangelization Summit is just such a thing. We Christians cannot live hiding ourselves away, hiding what Christ has done for us! We cannot find the pearl of great price and cover it up with something. The Church exists to tell everyone about Jesus Christ and about the good news of what he has done for us - which is truly amazing and awesome. And the New Evangelization Summit helps us get there. Last year I was not able to go, but I did hear the talks and was struck to the core by one talk in particular. Michael Dopp, in his talk, asked everyone in the crowd what they were going to tell their co-workers on Monday when they were asked what they did that weekend? "Are you going to tell them about the movie you watched on Sunday night? Are you going to tell them about the restaurant you went to on Friday after the Summit? Or are you going to tell them you spent the weekend learning about how to talk to everyone about Jesus and open up a conversation about the Lord and his work?" I have so done that. I've spent full weekends on retreat and then, when asked, I told the person about the one non-religious thing I did that weekend. I really have work to do - and I don't think I'm alone in this! So here's my little advertisement. There is one main venue in Ottawa, Ontario - but the really cool thing about the New Evangelization Summit is that there are 32 host sites around North America that will have a simultaneous webcast. So if you're in Lafayette, LA or Vancouver or Saskatoon or Michigan Centre, yay for you because there's a host site nearby! Check out www.newevangelization.ca for more information and to buy tickets. And happy evangelizing my friends! I'm not able to attend but have been praying for the Summit. I think it's remarkable that through the wonders of technology, people from all over the world will be able to participate. Just think of all the little seeds that will be planted! I giggled a little at your "yay for you because...". David Letterman used to say something like "opening this weekend in select cities. I hope to goodness you are in one of those select cities" which made me laugh every time. I'm an easy target, I guess!